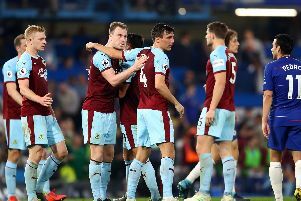 Burnley boss Sean Dyche will remind his players of the good work which saw the Clarets go eight Premier League games without defeat around the turn of the year. His side lost 5-1 at home to Everton on Boxing Day, a result which left them 18th in the table with 12 points, three points adrift of safety, and a point off the bottom at the halfway stage. However, they then earned 18 points from eight games, to start to climb away from trouble. Four-successive defeats have left them 17th, two points above Cardiff City, who have a game in hand, but Dyche said: "I think the overview is, from where we were at Christmas, you'd take it all day. "Eight unbeaten not so long ago, that's the madness of the Premier League. "We've got to remind ourselves of the good work there, make sense of what's happened in the last four games, and take it forward. "When you zoom in to the reality of this moment, it's not enjoyable. "Losing a game like that (on Saturday to Leicester), and then you analyse the details. In that eight-game run, we were doing the details well in both boxes, and I reminded the players of that before the game. "On Saturday, not that much wrong, but we needlessly gave away a corner, and then you've got a chance of conceding from a set piece." Dyche has eight players away on international duty, including Dwight McNeil, who was invited to train with the senior England side - with clubmates Tom Heaton and James Tarkowski - having earned his first official Under 20s call up. And he feels a break is beneficial: "i think a break is valid, I think we've got a few going away on international duty. "I think sometimes it's timing, and we've had a tough run. "It's about reminding yourself of the good work we've done, not so long ago, and get ready for the next batch of games, really important games."